Memphis Corporate Community Leadership Measured | NOBODY KNOWS…. 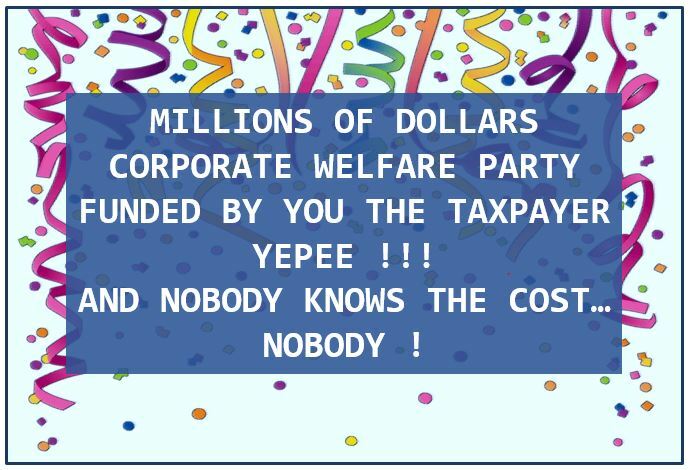 You, the taxpayer are paying for a corporate welfare party and nobody knows the cost ! A million here, a million there; who’s counting ??? This blog has stated that the Electrolux loss is small potatoes compared to the EDGE retention PILOT accounting nightmare and what should be forthcoming in the Shelby County Commission’s evaluation of 9 other tax abating boards per a recently passed resolution. The EDGE retention PILOT program is estimated to cost taxpayers $200M while being reported as a $600M gain by EDGE. This type of programming undermines the societal foundation upon which commerce thrives while exploiting a community in need and exploding inequality within the FedEx/Memphis Tomorrow economic development complex. But this blog is about Electrolux press reporting and underpaid taxes on PILOT agreements which are reduced property taxes for corporate/real estate interests. Payment – in -lieu of taxes (PILOTs) are always labeled “economic development” even if they’re not. With all types of numbers flying everywhere, current press reporting on the Electrolux incentive package would leave anyone’s head spinning. Reporting, across multiple media outlets, reveals an inconsistency and a taxpayer cost range regarding the total state and local Electrolux incentive package from $170M to $228M, a $58M range ! But no one seems to know the exact cost of this corporate welfare party paid for by you, the taxpayer. And if that is not enough, recent reporting in the Commerical Appeal reveals that Electrolux underpaid taxes on an already significantly reduced tax liability as afforded by the PILOT agreement. The CA reports Electrolux paid $500K in taxes in 2018 which would result in a $100K underpayment on annual property taxes that were already reduced by $2.7M per year based on an analysis of the Industrial Development Board’s Project Summary. PILOT payments, per the project summary payment schedule, should have been $600k and this does not include the under assessed property values that result from Shelby County Assessor staff shortages. So, how many more PILOTs are being underpaid and how much is PILOT property being under assessed ??? Nobody knows…..
Further, the lack of local enforcement of tax collections, per the IDB agreement now administered by EDGE, would coincide with a recent incident where the EDGE Board did not follow their own rules in the Mark Anthony PILOT award. The award resulted in a $1.2M excessive abatement award for 30 warehousing jobs, per EDGE rules, which in the end resulted in a $500k taxpayer loss as EDGE pocketed $51k in fees. Clearly, EDGE does not represent the taxpayer but instead represents corporate/real estate concerns while in pursuit of fee revenue. And, close examination of the Mark Anthony PILOT approval should reveal that this PILOT award was a real estate deal and Not economic development. It’s a true story that this week, the establishment publication in the Daily Memphian reported that Electrolux exceeded its PILOT commitment by 3x as voiced by the tone deaf EDGE. This assertion cannot be grounded in any sort of reality. And it’s also a true story that NONE of the Memphis press outlets reported on the incomplete bogus accounting of the EDGE retention PILOT program found in the Beacon Center of Tennessee study. This reporting leaves the Memphis public divorced from the facts as the corporate welfare party continues, uninterrupted, using taxpayer dollars. While the lack of a clawback provision has been covered as a criticism of the taxpayer incented Electrolux project, another fact not covered by the local Memphis press is that the project, which consisted of 15 years of abated taxes, did not break-even until year 20 after Electrolux had paid full taxes for 5 years. Breakeven in this analysis includes the $38M abatement. See IDB/EDGE Documentation. 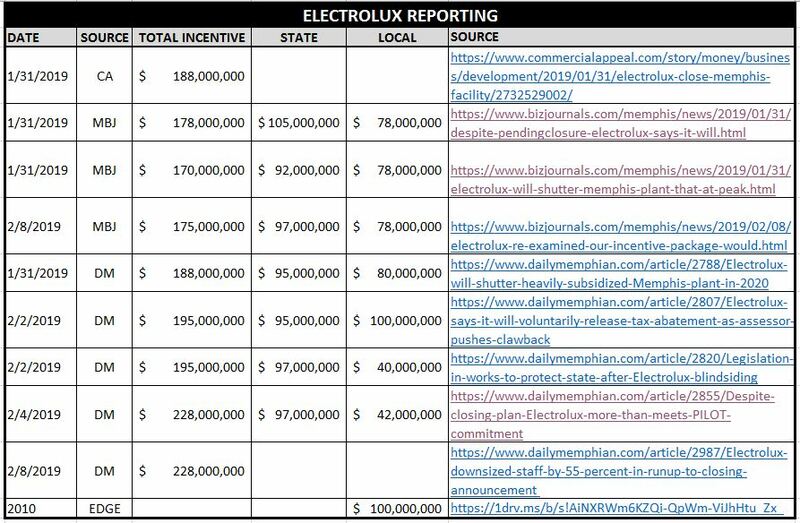 To see the the Electrolux incentive package ranges reported across Memphis press outlets, see below chart. A frequent reader would know that some of the reported amounts do not include the $38M tax abatement which should explain some of the discrepancy. But, while understandable in a fluid environment, the reporting on the Electrolux incentive package value remains inconsistent and confusing to readers which shows nobody really knows the total dollar value of the Electrolux incentive package. A million here, a million there; who’s counting ??? Its unfortunate that nobody knows the estimated cost of the corporate welfare party paid for by you, the taxpayer. Disconnected and understaffed government and inconsistent press reporting leave the taxpayer confused on the economic impact of incentives. This blog attempts to educate the taxpayer on the economic impact or the lack thereof of corporate/real estate tax incentives. Until taxpayers understand the cost of the corporate welfare party, the party is likely to continue, uninterrupted, at your taxpayer cost while undermining the societal foundation on which commerce thrives. Given the current visibility of Electrolux, which on balance is small potatoes to what has been and not happening in the Memphis economic development space, the below table attempts to quantify the taxpayer cost of the Electrolux project. The table below references employment levels and Electrolux property taxes paid to determine the net taxpayer cost as of 2018 and projected cost through 2020 using these three data sources: Daily Memphian , Commercial Appeal and IDB/EDGE Documentation. Based on this latest analysis, current Memphis/Shelby taxpayer loss of the Electrolux project is $38M while excluding the cost of State of Tennessee incentives. Memphis/Shelby taxpayer losses are projected to be $26M when Electrolux exits under current conditions. Opportunities do exist to minimize the stated and scheduled losses below such as going back 2 years and collecting on taxes underpaid and based on new higher property value assessments as well taxes being paid on the property following the departure of Electrolux. Or even better, a new employer for the facility. See below table and email jkent@pathtrek.net if you have questions.